After having seen a pre-production version at Panasonic UK last month, the waiting is over...... and it was worth the wait! This latest addition to Panasonic's G series range is the successor to the phenomenally successful DMCG2. The camera body is significantly smaller than the G2, but still has a good ergonomic feel, in size it sits between the G2 and the slightly slimmer GF2. Unlike the GF2, The G3 retains the 3 inch free angle touch screen and an improved electronic viewfinder. New improvements include an amazing Light Speed 0.1 second auto focus, pin point focus mode for super accurate focusing, an incredible 20 frames per second burst shooting mode (resolution is reduced from 16 megapixels to 4 megapixels), full screen touch focusing, 1920 x 1080i resolution HD video, a new stereo microphone, and intelligent auto plus, which allows for fine tuning of colour preferences, but retaining the point and shoot simplicity of the standard intelligent auto mode. 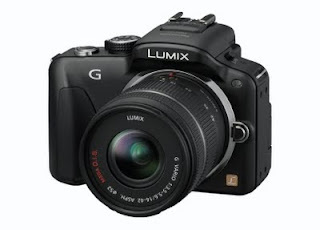 The camera is available in a kit with a lumix 14-42mm lens or body only. The body is available in choice of black, red or white finishes. I have only had it a day, so I haven't had too much time to play with it, but the experience so far is great. There are some really neat touches, like the peripheral de-focus feature, which allows you to pick out an area on the touch screen to focus on, and the camera does the job of blurring the surrounding area for you, creating artistic looking shots within seconds. I love this camera, it's small enough to be practical to carry around, but with all the creative control and quality of a bigger SLR camera. Will you be posting photos soon? I'm sure there will be some shots appearing soon, just as soon as I get some free time!